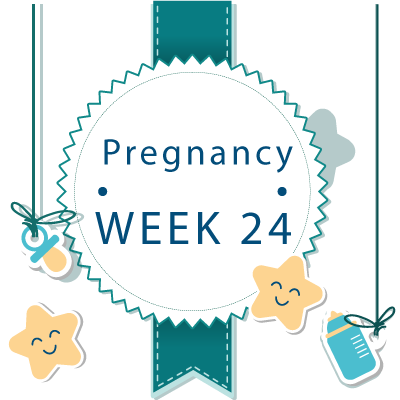 At week 24 of pregnancy, you should be at a stage where you can get a clear view of what to expect from motherhood. Your baby at this stage is all well and dandy, but you may not feel the same given that you may be experiencing some late pregnancy discomforts such as backaches, leg cramps, and swollen feet, etc. Getting back to baby, he/she is growing steadily, and is approximately the same size as a cantaloupe. Week 24 may bring about a few symptoms you’ve probably never experienced in your previous week. But stay calm, because just like the previous symptoms, these are bound to subside in the following weeks. This is one of those symptoms that seem to shadow you around right from the second or third week of pregnancy. But brace yourself, because these may get a bit worse than what they were before owing to the simple fact that your baby is growing and so is your uterus by each day. As your uterus expands, it tends to press against your spine, making it more curved and strained. In addition, your back muscles are also working overtime to cater to the extra weight. If your backaches do get severe and unbearable, speak your doctor ASAP as it may be a sign of sciatica. Tight or achy legs may be a sign of dehydration, so ensure you getting a rich fluid intake each day. To get some relief from leg cramps during pregnancy, try and stretch your legs and walk often. Keep your OB in the loop about the pains and cramps you are experiencing, because they will be in the best position to determine when medical attention is needed. Leg cramps as an example could be a sign of another issue such as a type of nutritional deficiency, so it’s definitely worth keeping a check on it. Just like your backaches, your growing baby may put some strain on your ankles and feet resulting in swelling. Again, the best remedy for this is to try and get as much light exercise in each day and keep your feet well rested. However, if you do notice severe, uneven or unusual swelling in your face and hands, speak to your doctor immediately as it may be a sign of preeclampsia—a dangerous pregnancy complication. These are the hallmark symptoms of pregnancy, and something you should’ve expected long before you even got pregnant. These tiger stripes will continue to evolve owing to your growing baby, and they probably will be more prominent if you’re pregnant with twins. Latin for Black Line, this vertical line tends to appear as you get into the later weeks of your pregnancy. It is possible that the line has always been there, but it was too light for you to notice it. However, this long stripe of dark skin may be more noticeable starting week 24 of pregnancy. Your raging hormones are to blame if you’re seeing double. This surge in hormones can decrease tear production resulting in increased fluid buildup in the eyes. One of the signs of this pregnancy symptom is when your wrists and fingers start to feel numb. This is also caused by the swelling in other parts of your body, which adds pressure to your nerves and wrists. On a brighter note, carpel tunnel syndrome will disappear once your baby is born, but until then, try to rest your hands and avoid sleeping on them during the night. You have probably already been feeling your little bean kicking in the past couple weeks of pregnancy, but they are about to get stronger and stronger. In fact, these sensations may be so strong that others might feel those kicks too. The recommended weight gain at 24 weeks is roughly between 14 and 16 lbs, but there’s no reason for concern if you’ve gained a bit more. However, it is recommended that you keep your weight gain in check for the healthiest pregnancy possible. In the past few weeks, the top of your uterus has reached a position where it is now a little over your belly. It is now similar in size to a soccer ball, and you may have a glucose challenge test (GCT) to check for gestational diabetes between week 24 and week28. This pregnancy related high blood sugar condition if left untreated can increase your risk of having a cesarean section or have a difficult vaginal delivery. 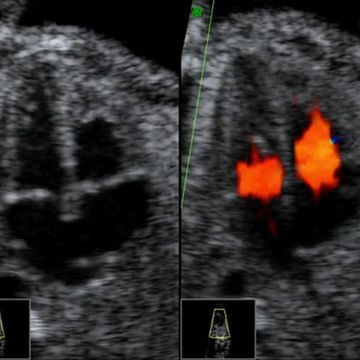 24th Week Pregnant Ultrasound - What to Expect ? As mentioned earlier, your doctor will most likely order a Glucose Challenge Screening test when you’re 24 weeks or so. This prenatal screening test is designed to determine how your body processes sugar, so you will be asked to drink a sweet liquid called Glucola, and then will have your blood drawn after about an hour. You may have to take a follow up glucose tolerance test if the results from the GC test are abnormal. This additional test will measure your body’s ability to process sugar over a three month period in order to determine if you indeed have gestational diabetes. If you do, you doctor will guide you on how to keep tabs on your condition to ensure a healthy pregnancy. Your baby in week 24 measures about a foot long, and its body is filing out proportionally. 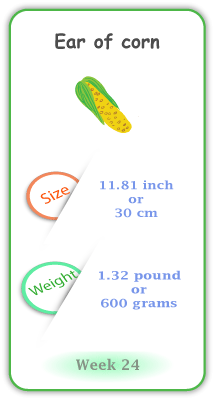 It is similar in size to a ear of corn and measures 11.81 inches and weighs 1.32 lbs Your baby’s brain at this point is growing at an accelerated rate and their taste buds continue to develop. Furthermore, its skin is less translucent owing to the pigment being deposited on it, and looks somewhat wrinkly because its body is creating skin faster than the fat required for padding underneath. Your baby’s lungs are also maturing with each day that passes, and are beginning to produce a substance called surfactant. This substance will assist in keeping the tiny air sacs in the lungs known as alveoli open.